for $829,000 with 5 bedrooms and 4 full baths, 1 half bath. This 7,176 square foot home was built in 1994 on a lot size of 0.48 Acre(s). 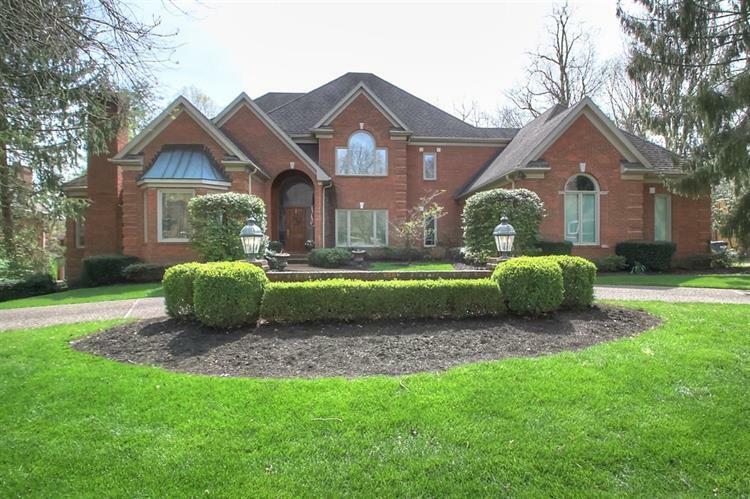 Stunning Dalton built home in gated community!Elegant two story Foyer;curved staircase & marble floor. Fantastic parklike setting;huge yard w/irrigation, tall metal fencing & mature trees. Formal Living room with bay window, hardwood floors.Handsome study, high ceilings, herringbone hardwood, wainscoting, FP with gas logs, French doors.Great Dining Room with inlaid floor, Dentil moldings. Four Masonry Fireplaces with gas starters! Main level Master Suite; trey ceiling, built in shelving & casement style windows with huge vaulted bath; his & hers vanitys, separate water closet, whirlpool tub & tile shower. Great room has fireplace & soaring ceiling with a wall of windows! Generously sized Kitchen with cozy Hearthroom, stone fireplace/gas logs. All bedrooms are large, great closet space, one is second Master, ensuite bath & walk in closet! Main level laundry; cabs, sink & folding counter. Finished lower level walkout; rec area, BR, full BA, office & workshop!Elan & security systems! A MUST see!